“I improvise when I play on my own, so I see where the patch I have made takes me,” says Stefan Paul Goetsch from his home studio in Berlin. Far from being an uncommon utterance among the modular crowd, whether it be jamming at home or taking a portable modular system to a live venue, this sentence has a certain gravitas coming from Mr Goetsch who has put in years of fertile music work between his bedroom producer days and his current status as a house-hold name behind Germany’s various theatre stage curtains. For some of us the modular system is a tool, for others it’s a way of expression and for others yet, it’s a way of thinking. Horizontalpitch: Have you been working in theatre productions for a long time ? Stefan Goetsch: For quite some time now. I started composing for theatre at the University in Hamburg in 2000, where I became composer in residence of a student theatre group. In the beginning I did everything, writing the music, setting up the PA, playing the cues for the show. Later I performed on stage, too. That was a good trial and error education into composing for this medium. During my time there I got to know some directors who were just starting out and I worked with a few, doing off-theatre, academy productions and festivals. The contacts I made there led on to paid work in the theatre world after I left University in 2006. It took about three years before I could make this my sole income source and I quit my job as a marketing/graphics guy for a studio equipment reseller in 2009. HP: Were you using synthesizers from early on ? SG: My first synth when I was 15 was the FM and white noise from a radio, which I combined with piano on cassette recordings. From then on synths have been a huge part of my music life. So for writing for the theatre, they always had a place. I remember using a lot of Crusher-X, a granular software synth, re-assembling acoustic recordings. But you can’t score every play with a synth, so I adapt to what the play needs – sometimes its an accordion, sometimes acapella songs, sometimes live-foley – its a huge playground and I love the diversity. HP: You mentioned cassette recordings; from your work so far it seems that tape plays an equal part in your compositions. Is it something you still use ? SG: I love tape in all its forms! Recording to tape give every track a “finished” feeling, which is in these days of total recall is very desirable. As theatre work is much less detail driven and more about the big ballsy move than film work, recording to tape and saying “this is it” is very productive. When I am at home I record live to a nice Telefunken M15 1/4″, when on site I use a Marantz PMD222 cassette recorder or if I feel like heavy lifting a Nagra III. In the modular I use Gieskes fantastic 317VCA module, that drives a walkman 1V/O. My last album Ashes was actually recorded all on tape, and the one I am working now on, too. HP: So you don’t sit in front for the computer to produce tracks, it’s just layering on tape ? Isn’t that an unending process with the chaos that is modular, or do you record multi-phonically ? SG: It’s much quicker! With the tape I don’t layer – I make a patch, mix it on an analog desk and start rehearsing the performance. Then I record it to a mono or stereo tape machine, depending on the sound I am after. The resulting recording I edit in the DAW and maybe overdub some stuff I find necessary. I have Silent Way, so I can switch to precision mode and record track by track with modular, if I need to. But the less mouse-clicks, the better. This way I can make four tracks in two days. HP: That’s quite prolific, especially for a modular setup, which makes me think you’ve spent a lot of time fine tuning the process. Would you consider the modular to be your go-to instrument ? SG: For everything except songwriting, it is. I still prefer the piano for that. HP: You do have a signature sound though, even when writing songs, or when writing for an orchestra like on your latest production. Can you tell us more about your work on “Das Cabinet des Dr. Caligari” ? SG: I did use many of the processes I use when I compose for electronic music for Caligari, even if the final instrument is an orchestra. There are even two pieces that started out as all modular versions, which I had translated to orchestra by a rather talented orchestrator. Reading the resulting score and seeing that this way of composing can work, I set out writing the rest. Usually I would think of what the scene requires, patch something up on the modular that gives me an idea, record that in in Ableton Live and use Melodyne to translate the audio to midi. That gave me whole mess of notes from which I subtracted the ones I liked. When I had the main theme going, I made a patch in Numerolgy that works the same way I sequence in the modular, by mixing CVs. I ran these to various virtual orchestra instruments until I found a synergy between instruments I liked. I then recorded the Numerology output and refined by manually dragging notes around. I can’t really remember much about how I wrote each piece, as I got into a very nice flow quickly, same as when patching. I did not forsake the piano, the main theme is based on the first piano idea I had when I talked with the director. In the end, the orchestrator translated all the midi files I sent him into a beautiful and very readable score that the orchestra performed admirably from the get go. HP: Your modular music is mostly pulse driven and similarly the pieces you wrote for the Caligari play contain loops and polyrhythms (or to be more precise: syncopation). 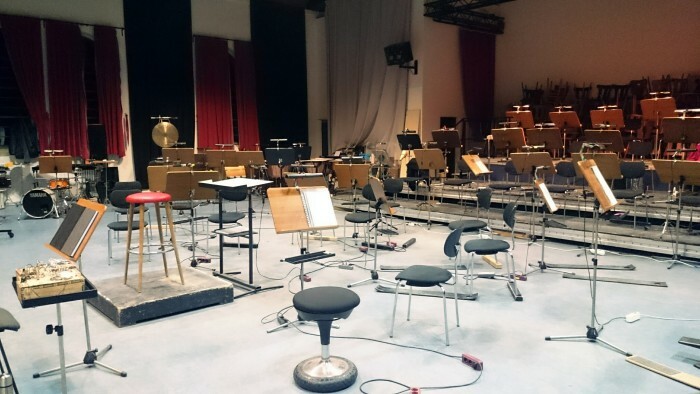 How did the orchestra cope with structures translated from an electronic music starting point ? SG: Overall, rather well! The conductor, Wouter Padberg, was fantastic in getting everything together. He understand what I was after. It took a few rehearsals until everybody understood what I actually meant with certain parts. Some instruments are interlocked so tightly that they don’t make much sense on their own, but sound exciting when together played with their counterpart. So you need time together to get that working. With the few rehearsals we had and the daily rotation of players I was very happy to hear it all come together at the opening. I do see a lot of ways I can improve my writing and am already busy in my head putting that together. HP: It is probably not that common to find people who have had the chance to work both with an orchestra and a modular system. Seeing as the majority of music produced for either “sound medium” is different, would you say there’s any correlation between the two? There have been a few tries to score modular music, but the results fall mainly under the graphical notation category. Do you think there is any room for scoring modular music, or … wiggling an orchestra ? SG: I put modular and orchestra together in Caligari, but it was recordings of the modular with the conductor getting a click track when both played together. I personally would have loved to perform with the modular and the orchestra, but that was impossible due to schedule and distance. Else, its all in the patch and what you want to achieve. When I played modular live with a singer at a performance in Bremen I had different sections for each part of the play, each song. That worked fine, but I had to leave the modular patched there and not change a thing. Recalling would have been difficult, as the singer relied on me playing exactly. Scoring so someone else can read it would be a very difficult thing. It could be a cool experiment for someone like Make Noise to sent their Shared System around with a score and call for interpretations. I would love to hear that! HP: So when you perform with the modular do you try to be exact ? Speaking of which, in what other projects do you use the modular, apart from theatre and your own records ? SG: I improvise when I play on my own, so I see where the patch I have made takes me. When I played Superbooth, I was very happy about the sound in the room, as I could dial in bass frequencies with great accuracy and effect. I ended up performing way slower and deeper than I had planned. When I play with my band Kudelski, I process recorded modular loops with the modular and jam on the Metasonix D1000 drummachine, as that is rehearsed like regular songs. SG: I use a laptop and Ableton Live, as I can sent CV from Silent Way, too. This opens up timed modulations and replaying of pre-recorded sequences, especially for drums. I like to keep those live and not recorded so I can tune them to the PA and room. The D1000 is great for that purpose. HP: Any other device, external or modular, that you’re equally fond of and that has changed the way you patch, or the way you interact with the modular ? 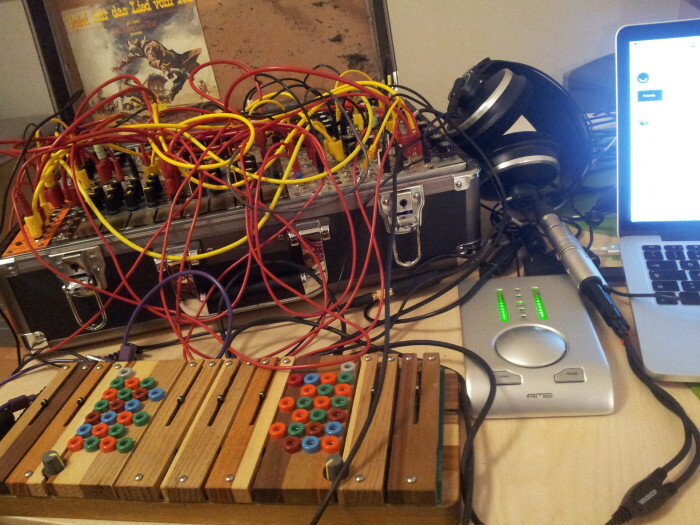 SG: Ciat Lonbarde Cocoquantus – this dual delay/looper has turned my world around a bit. I have recreated the whole of Caligari by using snippets from the rehearsals and processed them with it. It has wonderful broken sound to it, warm an crisp. When I perform as Hainbach its my main mixer for modular and whatever else I bring. Its like a workstation for abstrakt electronic music. Stefan Goetsch’s solo work, including his stable modular output, can be found under his Hainbach moniker . His scoring work is readily accessible on his professional page. His latest Hainbach album will be coming later this summer and is said to be more upbeat than his latest produce. There is also an ambient record on the works which should be available late fall. Entrepreneurial spirit, MIDI buff and self-proclaimed polymath. Claims to do more work than is humanely possible, but in reality spends his time perusing prose.